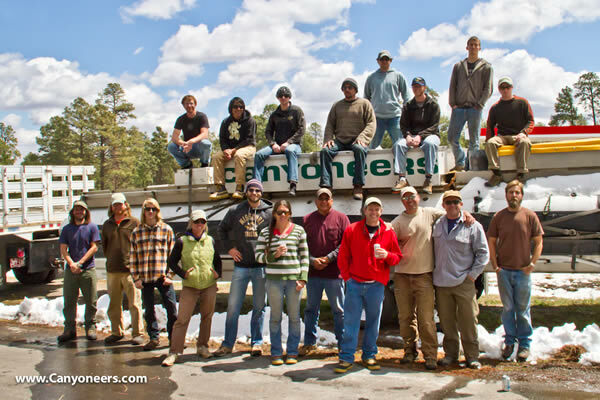 Canyoneers Grand Canyon River Trips: The 2012 Canyoneers River Crew! The 2012 Canyoneers River Crew! We have several new faces on our river crew this year: River guides Omar Martinez, Jason Schaller, Paul McCloskey, and Justin Boyce. Our new River Shop Assistant is Randal Weamer. Front row, l. to r.: Dave Cassidy (Hike In/Hike Out Guide), Tom Jones (Guide), Randal Weamer (Shop Asst. ), Carolyn Alvord (Trip Leader), Drew Houser (Trip Leader), Amity Collins (Trip Leader), Kenny Robbins (Driver), Greg Reiff (Trip Leader, oar), Jamie Townsend (Trip Leader), Jake Snyder (Trip Leader), John Crowley (River Operations Manager). Upper row, l. to r.: Cliff Ghigliari (Guide), Omar Martinez-Lezama (Guide), Jason Schaller (Guide), Brandon Green (Trip Leader), Kolby Kvam (Guide), Paul McCloskey (Guide), Ethan Dyer (Guide), Justin Boyce (Guide). Visit our "Your River Guides" page on Canyoneers.com.